Pictured are New Jasper Station, which now includes a four member lineup which will be appearing at the French Art Colony on Thursday. 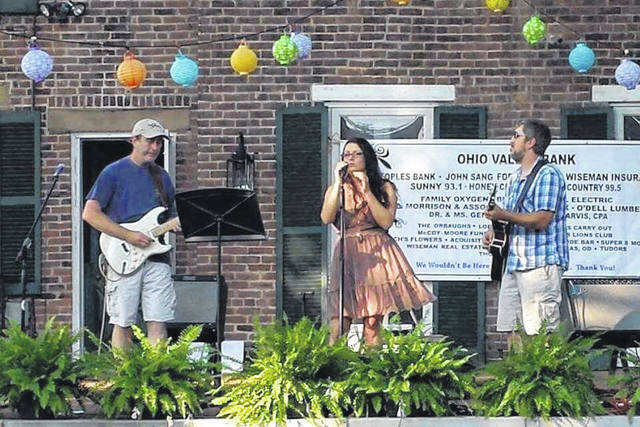 GALLIPOLIS — Appearing third in the series of the Hot Summer Nights concert series this Thursday evening in the pavilion at the French Art Colony, will be New Jasper Station. According to event organizers, this popular local group includes singer/song writer Jenny Walker, guitarists/song writers Mark Ward and Joel Ramsey, and bassist James Gettles. They thread a blend of folky roots, together with a grassy embrace. They carry their audience through powerful, high energy sets, sprinkled with poignant compelling moments. They deliver a blend of originals and covers by artists, such as John Prine, Bob Dylan, Bill Williams and Jewel. Jenny, Mark and James are originally from Gallipolis and Joel is from Ravenswood, West Virginia. Gates open at 6 p.m., with food available for a donation, and legal beverages for purchase. The music will start at 6:30 p.m.
Also available for sale will be one-of-a-kind, Hot Summer Nights T-shirts, created by Lucky Cat Design Company. In addition, tickets are being sold to enter a chance to win a stay at a beachfront Garden City condo. Tickets are $5 each or three for $10. A winner will be drawn on the final night of Hot Summer Nights, Aug. 30. All proceeds from the t-shirt sale and the prize drawing will be used to purchase fans for the pavilion, to make it more comfortable for all, during the summer months. Admission is $5 per person and is free for FAC members, as a benefit. For a full schedule of the live music performances in the pavilion, each Thursday evening through August, or for any additional information, call the French Art Colony at 740-446-3834. Submitted by Marianne Campbell on behalf of the FAC. https://www.mydailytribune.com/wp-content/uploads/sites/42/2018/06/web1_5.25-New-Jasper.jpgPictured are New Jasper Station, which now includes a four member lineup which will be appearing at the French Art Colony on Thursday.